KIRTAN, FOOD, CELEBRATIONS UNTIL MIDNIGHT! Beloved community, winter solstice is arriving and the turn of the New Year is nigh. 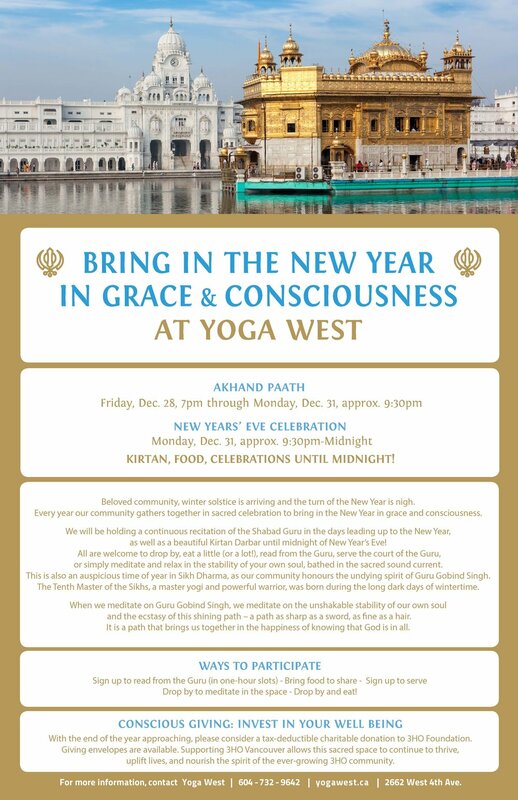 Every year our community gathers together in sacred celebration to bring in the New Year in grace and consciousness. We will be holding a continuous recitation of the Shabad Guru in the days leading up to the New Year, as well as a beautiful Kirtan Darbar until midnight of New Year’s Eve! All are welcome to drop by, eat a little (or a lot! ), read from the Guru, serve the court of the Guru, or simply meditate and relax in the stability of your own soul, bathed in the sacred sound current. This is also an auspicious time of year in Sikh Dharma, as our community honours the undying spirit of Guru Gobind Singh. The Tenth Master of the Sikhs, a master yogi and powerful warrior, was born during the long dark days of wintertime. When we meditate on Guru Gobind Singh, we meditate on the unshakable stability of our own soul and the ecstasy of this shining path – a path as sharp as a sword, as fine as a hair. It is a path that brings us together in the happiness of knowing that God is in all. - Drop by and eat! With the end of the year approaching, you may want to consider tax-deductible charitable giving to 3HO Foundation at this time. Giving envelopes are available. Supporting 3HO Vancouver allows this sacred space to continue to thrive, uplift lives, and nourish the spirit of the ever-growing 3HO community.